Great write up as usual Mike5. Im guessing that Caeser works for widmore, as he was following all the O6, he could have easily put a man on the plane in hope of it making it to the island. Thanks Jeff. Very possible Caesar is with Widmore. And yep, Ajira people are probably the ones that take over the 815ers old camp. Good question on Ben. Would he try to mess with fate? Try to kill Locke before he even leaves the Island? And would FUTURE/PRESENT Locke be with him while he's trying to do it? Definitely some interesting storytelling ahead...and I just can't stop thinking about how short Jack's beard was vs what it looked like when he reads Locke's obituary! lol There is clearly a passing of time between the 2 scenes! lol I'm sure of it! Great summary Mike. Lots to digest here and we can go in so many directions. Immediate reaction is that Ben is bad, but I think that Ben had to kill Locke because Locke could not kill himself. If so, then Ben at least knows (or thinks) that Locke is special. [Since he was resurrected I assume he is.] But then why say he's going to miss him? Hmmm. That makes it look like a plain old-fashioned murder, in which case Locke is not special and won't be resurrected, right? So what are we going to get when Ben wakes up in the makeshift infirmary? Ben telling Locke he killed him because he had to, or a very surprised Ben thinking to himself "uh oh - he IS special!" Yeah all good questions. And what about when Jack asked Ben if Locke WAS in fact dead and Ben just kinda stared at him. It's almost like Ben knows it's going to happen at that point. Even his story of Doubting Thomas the apostle leads to that theory. Maybe when he meets with hawking, she explains to him what must be done. It was all so crazy. There has to be a reason that at the sound of that name, Ben went bezerk! And I think it has to be more than he got the information he needed from Locke and was done with him. For some reason that Chang scene from last year with the time-traveling rabbits is stuck in my head. Do you think there is a connection with Christian not helping Locke up when he broke his leg last episode? Would that mean they are one and the same? Anyone else find Helen's cause of death interesting?? Think she might have hooked up with Faraday's mom and tried some time travel??? Also there has been no mention of Sayid at this point in time, where will we find him I wonder? Christian tied to Chang? hmmmm i dunno. I guess it could be time travel related. I guess i just first assumed it was because he was a ghost or something. But now that we know he and locke arrived to the island the same way..i just don't know! Interesting thought on Helen, Mark. I really didn't look into it more than it just being another device that made Locke feel even more alone in the world leading to him wanting to commit suicide. But you never know! As for Sayid...very true. We don't know where or WHEN he'll show up! lol We really didn't confirm Sun either, can only assume she's with Lapidus until we see more. Next week looks like a heckuva episode though! This EXIT from the island and the cameras, makes me think that this is like an experiment and these O6 and Others are being experimented with. It is Widmore conducting this experiment with metaphysics and other things and at the end it was all part of the experiment and their minds were being played with. How horrible!!!!! Just kidding maybe not but the thought crossed my mind. The other thing when Locke is taken by Abbadon to see the O6 people, it is not clear how he gets from Tunisia to St. Domingo and then back. Do we assumed they took a flight or was it like they closed their eyes and boom!!!! there they were. Ceasar physically reminds me of Richard and Ilana of Ana Lucia. Is kind of strange these two are not surprised that LOcke tells them he was dead and was going to be buried. Well lots of thoughts great episode, intense. I can't help but think that the name of the organization that Sayid was working with (Build a better world), sounds similar to a Dharma-ish mission statement. It is all very familiar.. remote, jungle like setting on an island and all. I wonder if the Dominican Republic has a pocket of EM energy? Just a quick observation, the bag that Locke/Bentham takes the cord out of was from Angel Hardware..... love the blog. No, I am not suggesting or asking about Christian tied to Change. I meant, if I am remembering the video correctly, the time-traveling rabbit couldn't touch it's other self. Wasn't Chang yelling about that? And Christian wouldn't touch Locke. I'm asking if instead of "wouldn't" maybe it was also "couldn't". As for them getting to the dominican republic, Abbadon actually says that he needs a destination from Locke as they're getting close to the airport. So I think we're good there! And I think when Locke told Ilana that he remembers dying...we see Ilana kinda look at him lie he's nuts and she walks away. So I'm not sure she was buying it. And when he told Caesar that Ben was the man that killed him...it went BOOM LOST! So we didn't get his reaction either lol More to come there! Jenn good thought with the Build a Better World. I was thinking something similar when I saw the T-Shirts that it seemed DHARMA-related. As for Pockets of energy? you just never know! Maybe we need Faraday's notebook to find out! Thanks Gallo! Good point about the "Angel Hardware" Ironic! I see now horseman. I guess you're referring to the ORCHID OUTTAKES VIDEO that we saw prior to the one in the season right? I'm gonna have to watch that again to see if he mentioned something about the rabbits. But yeah, I've been assuming that Christian "COULD NOT" help Locke and it had nothing to do with him not wanting to. And yeah, it very well could be time-travel related. No idea exactly how, but we know there are RULES! i noticed someone said locke and the ajira people are the in the present day, and as one of the people that believed that the survivors would be scattered in diff time periods i agree, but i wanted to clarify what info we're going on that confirms that? I think you need to combine the information from the 2 previous episodes. Jack, Kate and Hurley definitely disappeared in front of everyone's eyes on the plane (confirmed by Caesar). The flash and noise made when they flashed...was the same flash/noise we heard when Locke/Sawyer and crew moved through time on the Island. So boom....jack and crew are in DHARMA past. Meanwhile...we know at some point in the future, there are these canoes on the Island near the 815ers abandoned camp (aka...probably 3 years in the future from Oceanic 6 departure)...and we know that when our Time Leapers are in that time period, they find an Ajira water bottle in one of the boats....and when they take one of the boats...someone is following them and shooting. 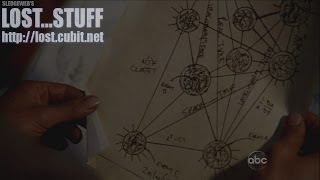 We also know that the OTHERS were building a runway on Hydra Island in season 3 (2004)....so theoretically it may have been built a few years later and available for Ajira 316 to land. Good recap as always! Just wanted to say Hurley's drawing of the sphinx - could allude to the Atlantean civilization. According to Edgar Cayce - secret Atlantean documents are buried in the paw of the Sphinx. And recent archeological investigators have discovered that there is a deep chamber in the paw but have not excavated it yet. I just think the producers were alluding to it b/c acient civilizations (like original Others etc...) not sure..
Just wondering was it Christian who told John about Eloise??? Completely forgot. And you're right about Jack's beard being an indication of time, I wonder if there were events that happened inbtw that may be shown later b/c that is quite a time - what was John doing all that time?? Hey Mona, thanks for all of the agreeing! lol Good catch on the Sphinx. I was getting pretty tired when I was writing the blog, that I just had to glaze over a few things. That was one of them! Christian is definitely the one who told Locke about Eloise. Anyway, to follow up on a previous comment of mine about proving that our Ajira passengers are in 2 different times. Damon and Carlton's official LOST Podcast is up (you can find it at lost.abc.com or on itunes). They mentioned that it is a question we should be asking (WHEN are Locke, Lapidus, "woman" and ajira folk in relation to Jack, Kate Hurley and Jin) They said we will find out "VERY SOON" and to avoid spoilers I won't say what episode. But considering there is no episode in 2 weeks, use your own judgement! lol I still think there is enough evidence out there to prove when they all are. 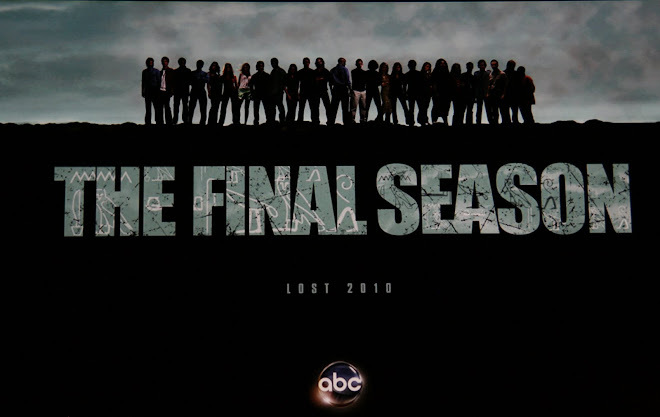 We just don't know where Sayid and Sun are yet officially. we should still be wondering who to trust between Widmore and Ben. Cuse brought up points that we really haven't seen Widmore do many evil things (except the shady video ben has) and we've seen Ben kill his father, abbadon and Locke. But naturally, they will not confirm anything. they reveal the episode number that we will find out what happened to aaron. to avoid spoiling. I will post the number at the end of this post (and the name of the episode)! 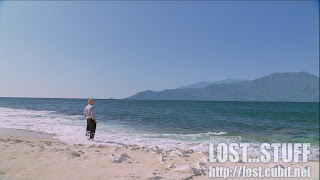 Another great episode of Lost; another WOW! postiug by Mike V. Fine job! I've given up on trying to guess which of Ben or Widmore is the good guy -- probably because it seems like neither one is. Ben we know to be a ruthless, manipulative, compulsive liar who will play or hurt anyone who gets in his way, and who seems to place his own agenda over even the island he claims to care so much about. (He knows the island wants Locke to be its savior, and he keeps trying to kill Locke.) But Widmore's explanation about Keamy and the freighter full of explosives doesn't hold water, he clearly manipulated Desmond into winding up on the island, and the version we saw in 1954 didn't seem particularly trustworthy. Also, I thought it was a nice gesture on Locke's part to NOT ask Walt to come back, but it's kind of a frustrating one also. The narrative has now caught up with Malcolm David Kelly's growth spurt, so there's no excuse to not bring him back into the action. After all the time they spent in season one on Walt's psychic powers and his own connection to the island, it doesn't seem fair to make that another narrative dead end, and I hope he comes back again before the end of the series. Walt's story needs to be told in its entirety! Anyone else think it was weird how the photo Widmore showed Locke in Tunisia showed Sayid in the exact position he's in when Locke reaches him in Santo Domingo? It's almost as if Widmore not only knows what the future will hold, but he knows how people will look like, where they will be, etc. in that future. Just pretty eerie to me. Since Locke found out that Widmore used to be the Others leader, I wonder why Locke didn't ask Widmore about Jacob. I would have if I was Locke. I agree with Walt. I mean, I know the kid isn't the greatest actor and everything, but before the show is over I think there needs to be some kind of redemption between him and his father (ghost i guess) on the Island. There also needs to be explanations of his "appearances" on the Island. Which I'm liking the "he unknowingly is appearing to them when he's dreaming" theory. But even his whole "POWER" that he had and Ben's line "we got more than we bargained for with Walt" from season 2. These things need explaining! J.B. I wasn't even thinking about the photo of Sayid being intentional on the writers' part to show him in the same place that he is when Locke shows up. I just figured it was laziness in the filming of the scene! lol Maybe they had forgotten to take a still shot of Sayid working on the school or something else when they were filming the scenes with Locke so they had to take a still shot from what they already filmed. I'm sure the question will come up to the producers and they'll just explain that not even THEY are perfect! Kinda like when they were showing a flashback in one of the older episodes, and they showed a 2006 dollar bill when it was 2004. They just can't catch everything! 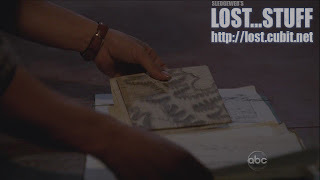 As for Locke not asking Widmore about Jacob.....that's just the way LOST is, no one asks people ANY important questions, and when they do...the person hesitates to answer, the music gets louder and then they cut to a new scene! lol Ahhhhh the mini-frustrations to loving this show! I am now wondering if Christian really OD'd or if he was actually murdered. Maybe Abbadon staged the OD to "get him where he needed to go." Really good blog. I am along time reader, first time posting. The carpet van that ben drives that says canton-rainier. It is a anagram for REINCARNATION. Did anybody else notice that this episode aired on ash Wednesday which is 40 days before good friday and wait for it "42" days before easter sunday. If Locke stoped the Island from moving through time then how are they going to get back to present time? Are jack and Cesear ever going to meet other than the plane? Where are the others in this whole future/present day thing? Maybe the reason they were shooting at the left behinders is that they thought it was the others from the island. This thought just came to me what ever happened to ben little friend who gave him the doll maybe it is charelotte who has to leave the island!!! The hotel name might be an anagram, I will have to go and watch it again. I hope this season they explain more about the hyrogliphics that seem to be every where. THere were in the Hydra station after the 108 minutes are up, they are on the "temple" they are on the wall that Ben is looking at after Alex gets shot. I know they is more but anyway. I am rambling now but when Jin was with the french crew, roussoe's(spelling is not my stong suit)boyfriend says that the smoke monster is a security system. I know somebody else said that. Does anybody know who. I got the hatches wrong, the one with the button is the swan not the Hydra sorry little bit confused there. Hey Jenn...I don't think we ever confirmed HOW Christian died. I know it's been so long that people are starting to think we did. 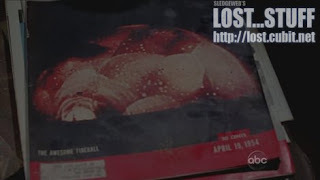 We know he got really drunk (saw him with Sawyer)...and we know Jack found him in the morgue. I believe at point this season Jack says it was a heart attack (or I was watching an old episode and that was said). Bottom line, it's always been a mystery of how Christian died and I have always thought that it was a key to the story. There was a reason he was in Australia. Sure, he tried to visit Claire. But he also brought Ana Lucia with him. He ran into Sawyer. I've always thought he might have tipped off Malkin (the psychic)...he probably knew that Jack would come after him. It all just seems to tie together to Flight 815. Since John Terry (Christian) has full-time status on season 6, we may just get the crazy "ghost's" flashback story to fill in the gaps. We'll see! Anonymous...thanks for being a long-time reader and deciding to post. Rousseau was the one in season 1 that mentioned the monster was a security system "for the Island." So now we know where she got the term. It was from Robert who was infected by the monster itself. Robert noted that it was security system "for the TEMPLE." So that's all we know for now! There could be what some consider semi-spoilerish about next week's episode. But I just thought it was intriguing information! My theory on the coming war. It’s not a war between Ben and Widmore, but between Jacob and Christian. The clues have been subtle but there. Jacob’s first words to John were “Help me,” but help from whom? When Christian came to the island he started to take over. The next time we see Jacob’s cabin Hurley saw Christian in his suit and white shoes. Than the panicked eye of Jacob looks through the window. It’s at that point Christian replaces Jacob, not speak for him like he claims, and takes over. We don’t see Jacob again and Christian’s clothes change to a more native attire to reflect his new role in controlling the island. From this point we see Christian multiple times manipulating John, Claire, and Jack to do whatever his plans are. Christian wanted John to move the island not to save it but to exile him because John is the only one who cam help Jacob regain control of the island. And just like the good pawn, John listens to him. He will not really be able to save the island until he starts thinking for himself and stops relying on everyone to tell him what to do. The war won’t be a battle fought with guns but a faith war for the island. I was actually thinking the war might be bigger than something we have even comprehended yet (i.e. not between Ben and Widmore). Not sure if I had shared it here yet. But, Stedman, I like where you are heading with your theory. What if Christian is lying? why did Jacob say "HELP ME?" How did he change clothes when he was still wearing the suit in the beginning of season 4? Pretty intriguing stuff! Another great post Mr. V! As always, a great episode of Lost not only gives us some good answers to past questions but it also gives us even more questions to ponder. Some of these you have already alluded to Mike but I wanted to put them in a nice little arrangement. **Why did Caesar hide the shotgun from Ilana? **How did Ben trick Charles Widmore into leaving the Island? **What "war" is Charles Widmore warning about? **Does Charles Widmore really want Locke to lead the Others? Does Ben? **What do Walt's dreams about Locke mean? **Why wouldn't Kate care that Sawyer (et al) will die? **Why did Jack (so quickly) purchase tickets to Sydney? Was Ben lying? **Why did Ben kill Locke? Was it connected to Locke saying he was looking for Ms. Hawking? **What happened to the Oceanic Six? Why did they "vanish" when the plane crashed? **Did Ben realize that Locke would be revived when he came back to the Island? **Is there anything special about the day or the way Helen died? Keep up the great writing Mr.V! I know there are a ton of bloggers out there but I prefer your style to anyone else's. I've been wondering how does a person get a fake passport like Widmore did along with Locke's picture already in it? Is there nobody around to check the authenticity of it? Thanks for the wonderful compliments Johnny! I wanted to touch on one of your questions with Jack QUICKLY buying a ticket to Sydney. I'm not so sure it was as quick as we were led to believe. In my blog (and comments since) i've been obsessing over the size of Jack's beard when he encounters locke. it's not up to CRAZY LENGTH yet...so some time must have passed between that encounter and the hotel scene. Jack also told kate he was FLYING A LOT and hoping to crash. We also need to allow time for jack to get hooked on his meds a little longer and be more drunk! Jack reads the obituary on the plane returning to Los Angeles. 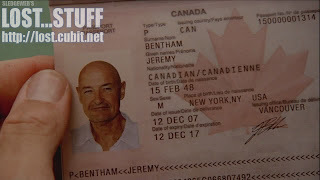 And Ben tells Locke at the hotel that Jack booked a flight to sydney that returns the next morning. So....some timing is off there. Yeah I read your comments on Jack's beard in the blog Mike and it certainly is worth noting. Don't know if we'll ever get the answer to that. Can you discuss in depth your thoughts on the triangular relationship of Widmore, Ben and Ms. hawking? They seem to be THE primary centerpieces of the show right now (at least until we know more about Jacob). Widmore apparently has a lot of $$$ at his disposal and can hire at will. But what EXACTLY is his motivation in regards to the Island? Is it personally for greed, is it just to show up Ben, is it to use the Island to be able to control disease, sickness, etc? What about Ben? Exactly who does he have on HIS side? I see nobody. What is Ben's motivation for the Island? What does Ben know that nobody else knows? What does he know about Widmore and Ms. Hawking and why is he working with Hawking? And what can we truly make of Ms. Hawking? How much of her story do we really know? Is see a former partner/lover/wife of Widmore? Is she a DeGroot? What is her motivation and how does she know so much? It seems that Locke, Desmond, et al are all just pawns being played in this big ol' chess game by these three manipulators. I want to know more Mike; I need to know more. Can you help me out here? (P.S. I know it may have been a typo on your part but name is Jonny not Johnny). Thx! I am like everyone else here..the timeline of Locke/Bentham's death in this ep. doesn't fit with what we saw in past eps. with the length of Jack's beard and his mental condition. Also, did anyone notice that the note Locke wrote to Jack was different in this ep (when we actually saw him writing it) than it was in "316" when Jack read it on the plane. Check the screen caps from each ep...the note says the same thing but the handwriting is different. Combine this with things like the butcher shop completely changing from the time Ben went there and talked to Jill about storing Locke's casket to when Jack went to pick it up. It is completely different...they crew can't be this sloppy in production..it had to mean something. My question is....is time skipping off-island as well? Could this explain all these discrepancies? Maybe why Kate's behavior and looks and demeanor changed so drastically from the night on the dock to the next night when she showed up in Jack's bedroom...she looked like a different person. Maybe these things will never be explained but they bug me. Also, what was in that package that Ben had stored up in the air vent in the hotel room when he was getting Jack cleaned up? It seemed important because they purposely showed him getting it down out of there. But what make him return to his assassin ways? The events at Hurley’s hospital and safe house where he killed three people happened after Locke’s visit. And can we assume that if he was done killing for Ben at that point that it was Ben’s people he killed at the hospital and safe house. Sorry Jonny, sometimes I just see letters that are never even there! As for explaining all of your questions? I have no answers. Those are pretty big mysteries on the show that they are GOING to and HAVE to answer! But now that we know Widmore has been on the Island for 30 years (if we can at least believe that THAT was true), then we have to start thinking that Penny was born on the Island too. Unless the mother left the Island and she was born there. Were Widmore and Hawking romantically involved or more of a brother sister thing? How does Daniel play into this? We know he has been on the Island less time that everyone because he never got a nosebleed. So if Eloise is Daniel's mother...who is HIS father? I think there is more to learn between the relationship between Dan, Eloise, Charles Widmore and Penny (let's throw Desmond into that mix too). But we just do not have enough information yet to make a concrete theory. We can just make some guesses with making a lot of assumptions along the way. What we do know is Ben was born off of the Island and came there when he was 12. He started talking to Richard at a very young age (you know...when they start evaluating their leaders). Richard told Ben it wasn't time for him to leave the DHARMA crew yet. But what about in the days that we're about to see with Jack, Hurley and crew? Widmore should be the leader of the Others at this time and Ben might be WORKING for the Others undercover as part of DHARMA. (we know he was with DHARMA still when the purge happened. He killed his father wearing DHARMA gear). And we know when the Purge happens, that BEN becomes the leader of the others which is 12 years before Oceanic 815 crashes. We don't know exactly how long after 1954 Widmore becomes the leader so we can't determine WHEN he was exiled. But perhaps it was right around the time of the Purge? Whew, Anonymous....I hate to say it, but I think what you're looking at is minor differences in the production from one episode to the next. I just don't think they'd ask us to analyze 2 letters that say the same exact thing and determine if they're different! With the butcher shop...i didn't notice that either, but these just seem relatively minor in the scheme of things with the show. One question someone posed to me though is....how did Hawking get the suicide note? Did Ben take it from Locke's back pocket and give it to her? Obviously the police didn't get it or they would've given it to jack Shephard (i would think). I had just assumed Ben took it. But then you have to wonder if Ben knew about it already on the Plane when Jack was talking about it. Ben was all bitter that Jack got to have a private meeting with Hawking....and this is when she gave him the letter. What exactly was Hawking keeping from Ben? Stedman - Sayid makes a comment like "I'm not taking any chances since Bentham died" right? So he must've gotten wind that he died and then knew that people were in trouble. But good question on if it's Ben's cronies, Widmore's or someone elses all together! ok...i think i've rambled on enough! OK, Mike. I give in to the fact that the note being different might be a production error. But why would the butcher shop be totally different? It goes from having one door and looking kind of old and just saying "Butcher Shop" on the window to being much newer looking, having double front doors with the name "Simon's Butcher Shop" printed on the door. Thx for your comments Mike. Since Widmore supposedly knows about the exit points can we assume that he himself was "exited" there as well? Your previous point about the camera being there is critical IMHO. If Widmore placed a camera there (and I think we all believe he did), why was it apparently NOT there when Ben exited? Also, who else has Widmore seen exit the Island? Also, remember when Friendly had the conversation with Michael in the alley in New York? Didn't he tell Michael that he could come and go as he pleased? My memory is fading here, so please help. If so, then I think we can conclude that maybe gay ol' Tom was working for Widmore not Ben but I could be totally messed up with that theory. I'm of the persuasion that only those that actually moved the donkey wheel would be disposed to and thru Tunisia. As far as we know, Tom certainly didn't move the wheel, Richard didn't and we know the Oceanic 6 didn't. So is there any significant theories on why Tunisia is the exit point of those that do move the wheel? Widmore knows how to get off the Island (and so does Ben & Locke) but why doesn't anybody know how to get there in the first place? Jonny...I think Widmore told Locke that he was "EXILED" and that he was tricked into turning the wheel by Ben. So yes he has indeed EXITED there. So there's your answer for that. I have the same question on Tom and Richard and Ethan and how they have come and gone from the Island. Best I can come up with is that they are the NATIVES (pre-dharma people) on the Island that are "priveleged" (richard's words) to the information of how to come and go from the Island. I think turning the Wheel has a "SIDE EFFECT" of booting you from the Island or something like that. I mean, they "SAY" that they've used the submarine before to come and go. But at the same time we've never seen it in use. We saw Juliet drink Orange juice with a drug that knocked her out and she WOKE UP on the submarine already at the island. And she was strapped in really good. They mention that the final approach or something is REALLY BUMPY or something like that. And Richard made a comment like she is going to WANT to be out cold for her trip. no problem on rambling...i'm the biggest culprit! There have been other large set changes as well. Off the top of my head when Miles goes to the ladies house to talk to her son the picture frames along the stairs are large wooden frames but when he comes down the stairs their small metal frames. They gave us good shots of the frames coming and going, were they trying to tell us something, don’t know, but their fun to look for. I don't know the rules of time travel (LOL), but is it possible that Locke is alive, or un-dead, because Locke, Ben and the rest of the plane, minus the O6, time-jumped to the past? -Michael was hit by a car (the elusive Golden Pontiac) in NYC and broke his leg. ~Locke was hit by a car in a parking lot while chasing his mother. ~Juliet’s husband was run over by a bus. ~Kate’s childhood sweetheart Tom was killed in a shoot-out car crash. ~Hurley crashes his Camaro during a police chase. 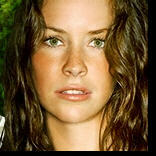 ~Claire and her mother were in a car crash (it put her mom in a coma for five years). ~Shannon’s father Adam Rutherford was killed in the same car accident that paralyzed Jack’s wife Sarah. ~When Jack attempts suicide on the bridge (prompted by seeing Locke’s obituary), there is a car crash which stops him from jumping. ~Michael crashed his car on the docks in a failed suicide attempt. ~Locke’s father Anthony Cooper was in a car crash in Tallahassee right before he mysteriously turned up on the island. ~Kate was in an accident with the marshal, which led to her escape, after a black horse ran onto the road…Kate saw a black horse on the island (along with Sawyer’s boar). ~Martha Toomey lost her leg in a car accident; her husband Sam Toomey (Hurley’s fellow cursed lottery winner) committed suicide. I may have missed one here and there but obviously, the producers have some sort of infatuation going here don't they? ~Locke says he “fell down a hole” which can use as a reference to the story of Alice in Wonderland. ~Rabbits are a symbol for fertility and we know the island has fertility issues. ~There was a rabbit in the hatch and a rabbit in Sawyer’s cage with the #8 painted on it. ~In the “Orientation” films, Dr. Marvin Candle holds a rabbit with #15 painted on it. ~Sawyer was reading “Watership Down,” starring rabbits. ~There was a white rabbit in the magic show at the old folks’ home where gramps was trying to escape from. ~Ben had a white rabbit as a child. Very comprehensive lists there Scott! Most of the rabbit things can be tied back to the White Rabbit which is an ongoing reference to Alice in Wonderland (which Jack reads to aaron in his season 4 flash forward). Through the Looking Glass I believe was a sequel novel to Alice in Wonderland as well. So I'm sure that has a lot to do with their love of bunnies! I know branding the bunnies with numbers is a reference to another movie that i can't think of right now. The car accidents yes...they sure do love them! While we're on the subject...they also love their Wizard of Oz references! of course, it's easy to see that the land of OZ and Wonderland can be tied to a lot of the crazy things happening on that crazy Island! What's keeping me occupied is the 'war' between Ben and Widmore. How ironic is it, that they seem to want the same thing, for Locke to go back to the island and save it. Which one of them, if any, is bad, or could they possibly both be bad? Young Walt is not so young anymore! Nice to see him included. Also, I liked the reference to Helen, which I was waiting for for a very long time. Too bad she's bad though. After two weeks of Oceanic Six and off-island people, can we please see Sawyer, Juliet, Jin, Daniel and Miles again? And what about Desmond?? I want to know Penny's still alive! Anyway, great episode and I'm looking forward to the next one! I haven't seen anyone on any site mention this, and it seems glaringly important to me somehow. Jacks Granddad is named RAY. The off island Dharma station is the lamppost, with a picture of a lamp and rays of light. Could Ray be the ray of light? (The very clever fellow?) Jack and his father are spinal surgeons; Christian’s father could be a very intelligent and educated man as well. My biggest question is why wasn't ANYONE surprised to see Locke? They'd all left him on the island but it didn't phase them at all that he was visiting them. No questions about how he got off the island or who's still alive. So why? Nice blog Mike V. And great comments by everyone. I have one question. Is there a reason why Ben isn't in jail somewhere in the world??? He is a mass murderer, after all, and he has admitted it as such. We know he gassed his own father to death. How many did he exterminate in the Purge? How many times can he kill Locke? He admits to killing Abaddon. He attempted to kill Ana Lucia. I believe he attempted to kill Charlotte. He has confessed to his desire to kill Penny. Is his middle name Dexter? Seriously, I don't know why Ben is even allowed to be a part of society. When it comes to Ben, it seems he gets a free pass to do whatever he wants to whomever he wants. How did Locke's dad get to the island. Was that before Locke blew up the submarine or after? If there is an exit point perhaps there is an entry point. Don't know if this was covered lower in the comments because I didn't read through them all (a good chunk, but I can't justify all the time it would spend to read 50 comments)... It would seem that Ben is not trying to thwart Locke, because Ben goes to so much trouble taking care of Locke's body and making sure that Jack brings him onto the plane. I don't recall Locke saying anything to Jack about Locke needing to get back to the island himself in order to make things work. So Ben could have let Locke be buried and be done with him - that is, unless he wanted Locke to be resurrected and fulfill his mission. I think there's a whole piece of the puzzle we're still missing here and that is Ben's ties to Eloise Hawking. Did he know to go to Hawking before Locke said it in the hotel room? He knew ABOUT Hawking but may not have known that he had to talk to her. Or maybe (i may have mentioned this in the blog not sure)...we know the last time Ben tried to kill Locke it was because he heard Jacob. So now Ben knows that "SOMEONE" told Locke to talk to Hawking. So once again Ben knows that Locke "IS" perhaps special. I think I'm rambling again. My point is that Ben may not have known until he talked to hawking that they'd need Locke's body to create a proxy. For all we know...it didn't even HAVE to be Locke that "filled those shoes" (no pun intended). On another note, this could be also how Richard knows that Locke has to die...not to fulfill some christian/island prophecy or method of getting back to the Island...but merely because re-born Locke told Richard in the future (but prior to when he fixes Locke's leg) that he died but is back on the Island and alive. Clearly, Richard was not an expert in 1954 on the time traveling aspects of the Island. MIke, Can you rehash a bit on your thoughts on why Jack was the only one at Locke's, er, Jeremy Bentham's funeral viewing? Seems that now we know Locke has tried to convince everybody (sans Sun) to come back to the island, they'd all be at least a little bit intrigued to see his dead corpse. WOuldn't you think so? 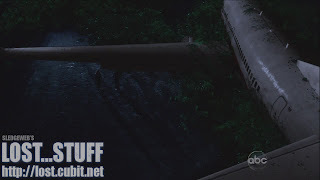 So Lapidus flies the plane that lands on the runway and then steals a boat to go....uh, where? I love the character playing Lapidus. Kinda tells me what Lost would be like with Jimmy Buffett as a pilot......hey wait...is the island really Margaritaville? I dunno Bryan, Hurley looked like he wanted nothing to do with Locke. Sayid seemed alarmed by "bentham's" death but I could see him not attending the funeral. Kate pretty much told locke off and even asked Jack "why would I go to the funeral?" Ben didn't attend at first well because he killed him! But later he went to collect the body...and recruit jack. Sun?...well sun was never visited. Based on what we learned last week...Jack was the only one that Locke "convinced" which is the most ironic part about it! Funny stuff with Lapidus, anonymous! I'm a big fan of the character too. So glad he's back on Island! Hey, Mike! Love the blog! I'm new here, but definitley an addict. I've been keeping up with the site everyday and, like many others, it keeps me going til Wednesdays! I had a question. Do you, or does anyone remember the episode where Christian visits Jack at the hospital in a flash forward? Do you remember if Jack mentions that Locke told him he saw him on the island before he left? I'm sure he didn't but I just can't remember what was said between them and I'm sure it was important. Do you remember? Thanks for the compliments Jane. Glad you're getting your LOST fix here between each episode! Yeah Christian visists Locke in season 4's "Something Nice Back Home" episode. This takes place PRIOR to Locke arriving in Tunisia (i.e. off island). And Jack never talks to his Ghost Dad. He sees him but gets interrupted by a collegue who signs off on the drugs that will eventually lead to his downward spiral! They never spoke! Of course, that's why I couldn't remember what was said between them haha! Thanks Mike! It seems like every episode from the 3rd one on this season has just gotten better and better, culminating (so far) in the 7th ep about Jeremy Bentham. As a big Locke fan, I thoroughly enjoyed seeing him begin to fulfill whatever destiny has in store for him, even if he has to die in the present day to make it happen. This ep did start kind of slowly as it worked it's way up to a breakneck pace. (Haha, "break neck"! Get it?) Locke went all around the world trying to convince the Oceanic 5 to go back to the island, but his unconvincing and strident appeals fell on deaf ears. But then, just as Locke is gonna hang himself, Ben tells him Jack actually booked a flight to Sydney, so Locke wasn't really a failure! At least not until he mentions Eloise Hawking! After Ben strangles Locke, when he's leaving the hotel room he turns to tell the hanging corpse, "I'll miss you John. I really will," yet he already knows he's going to see Locke again on the island. I think what Ben meant was, he was really going to miss Locke in the present day, because he knows that he'll be returning to the present day several times in the future. Perhaps he'll even be banished from the island forever by the series finale (I DON'T think he knows that, however). But we can easily imagine that Ben will miss sparring with Locke when all he has left is his memories! Dead ISN'T Dead: When it comes to the present day, it seems clear dead is dead. But when it comes to the island, which by now includes time traveling like it includes mangoes, dead is definitely not dead unless the death took place on the island. Which seems to make it a place that operates kind of like heaven. The kind of heaven that moves around a lot. Confusion for Dummies: Once again, the whirling dervish of timelines and life chronologies and intersecting relationships the show is now juggling have me just short of a straightjacket. Like I said before, I can't keep up with this stuff myself so I count on Mike to make sense of it and then I just let the next episode spill its newest secrets upon me and pretend not to be confused. So far it must be working because I'm having a great time! L&D of Jeremy Bentham is a fantastic episode. And, once again, I stress this stuff only improves on rewatch. The time travel stuff is getting you theorizing, and that's exactly what the intent of this season was. But, I cannot validate nor distinguish any of your theories! But, the whole talking out of suicide only to kill him was just a brilliant scene. 2 class act actors giving it their all. As for Ben and his knowledge of seeing Locke on the island again? Well, I don't know about you, but Ben looked pretty damn shocked when he saw John Locke standing before him (or sitting). Granted, Ben lies so much, you never know when he's telling the truth. But, eventually you'll know what's the truth from fiction. Season 5 was by far the most confusing. And this blog came in very helpful for everyone, including myself. We all made sense of it together. But, we had endless debates about time travel and how it applies on LOST. People constantly got tripped up from other time travel stories and how it should play out the same in LOST. 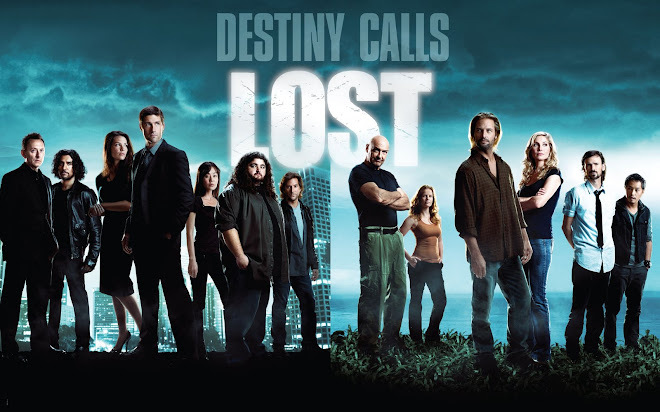 But the LOST team made it very clear in the show and out of the show the rules of time travel on LOST. But still...that doesn't mean they don't try to play around with those rules. It made for some awesome television! And some big soapbox speeches from yours truly. I envy you watching it for the first time. But, I think you'll have to admit even yourself that you will want to rewatch it when all is said and done. That will become clear to you! Enjoy! 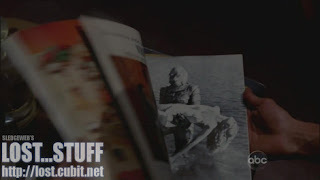 Interesting note: you mentioned the picture in the magazine from Creature From the Black Lagoon. The actress in the photo being carried by the creature is Julie Adams. She also played Juliet's neighbor Amelia in the season 3 episode A Tale of Two Cities.